I used to live in Cherry Valley. Come to think of it, I think I’ve lived in every little bitty Upstate town. Oh, I am exaggerating. A little. Last year about this time, the family took a drive out to Cherry Valley to see the Judds Falls. Cherry Valley was a gateway to the American Frontier. The reason was this: there is a ridge of mountains and hills that run east to west, separating the Mohawk from the Susquehanna watersheds. But there are smooth fertile glacial valleys both north and south of this ridge at Cherry Valley. The ancient Iroquois discovered that these glacial valleys formed a natural stairway, giving them their easiest way through the ridge. Cherry Valley was also quite near to the Mohawk River itself, which veers sharply south into Canajoharie. 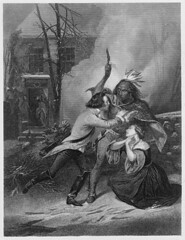 The result was that Cherry Valley was an important link between the Mohawk and the other Nations of the Iroquois Confederacy. 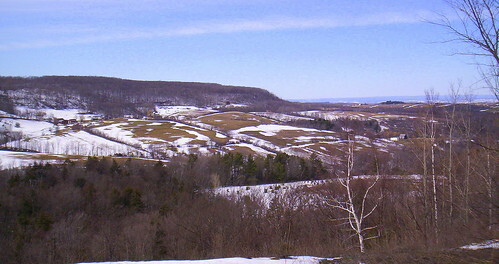 Cherry Valley’s favored position along the ridge made it part of the natural route east to west as well. Cherry Valley was the location of the Cherry Valley Massacre during the American Revolution. Have you ever seen the Mel Gibson movie, “The Patriot”? A great deal of the movie’s plot comes from various little events that actually occurred during the American Revolution. In the movie, Mel Gibson’s character speaks of a massacre of innocent women and children at a fort (called Fort Wilderness in the movie). Gibson and his men take revenge on the Indians and French perpetrators. During the American Revolution, there were several massacres, but the most famous one was probably the Cherry Valley Massacre. One of the most notorious events of the Revolutionary War was the Cherry Valley Massacre of November 11, 1778. A regiment of Tory rangers under Captain Walter Butler and Native forces under the Mohawk war chief Joseph Brant, fell upon the settlement, killing 47, including 32 noncombatants — mostly by tomahawk. 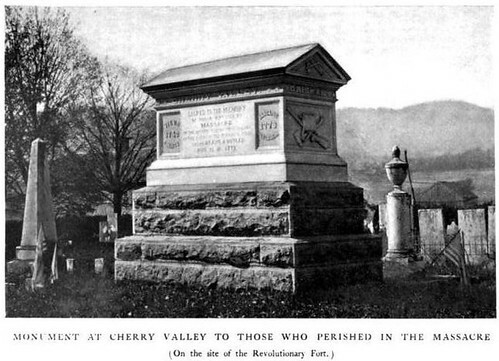 The Cherry Valley Massacre, along with an earlier rout by Butler’s forces at Wyoming Valley in Pennsylvania, in time induced General Washington to redeploy some of his forces who were staving off the British, and focus them on securing the frontier. Thus General Clinton’s famous 1779 raid on the Southern Tier via Cooperstown, a tale best left for another day. I have not seen the monument to the Cherry Valley Massacre. I suspect it is somewhat out of the village. Next time we go through, we’ll look for it. There is a large monument erected to those who were killed. After the war, Upstate New York was rapidly settled. The construction of the Erie Canal, connecting the Great Lake Ontario to the Hudson River and to the Atlantic Ocean, brought economic prosperity to many Upstate cities. The discovery of sulphur springs in the mid-to-eastern section of the state brought tourists seeking the health benefits of the warm springs. Many Upstate towns are named after such springs: Saratoga Springs, Richfield Springs, Springfield, Sharon Springs, and so on. Wealthy families from New York City came north to these resort towns. Cherry Valley wasn’t as prosperous as the other Upstate towns (it was somewhat removed from the Erie Canal), but it has its share of importance. History has it that Samuel Morse developed his telegraph machine here. And the National Bank of Cherry Valley is the “oldest bank in New York State west of Albany.” The inside of the bank still retains much of its charm from its establishment in 1818. Actually, driving into Cherry Valley is like going back in time. If it wasn’t for the power line poles and the cars, I doubt the town looks much different than it did 100 years ago. Many of the old houses are still standing. I hadn’t been through the town in 15 years, and absolutely nothing was changed. The old dingy laundromat and the Limestone Inn were exactly the same. The old Central National Bank still stood, in excellent shape. When I lived here, I had once visited the little-known and well-hidden waterfalls. 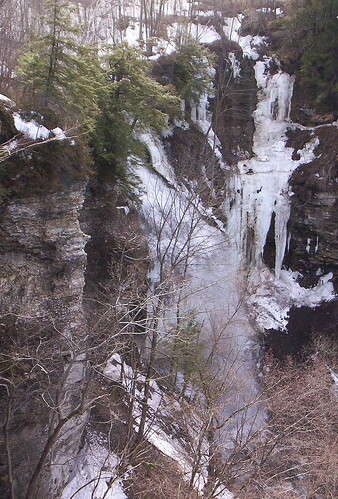 According to northeastwaterfalls.com “Waterfalls of the Northeastern United States,” the falls at Cherry Valley are called Judds Falls. No offense, but the name Judds Falls is just not majestic enough to describe the quiescent beauty of this magnificent feature. The Falls are off Route 166, just under the Route 20 overpass and where Vanderwerker Rd begins. The Falls flows out from underground Vanderwerker Rd (which I thought unusual), but you cannot see them from that road. Below is a photo I took while standing above the Falls on Vanderwerker Rd. You can hear them from this vantage point, but you cannot see them. They are actually 20 yards below your feet. 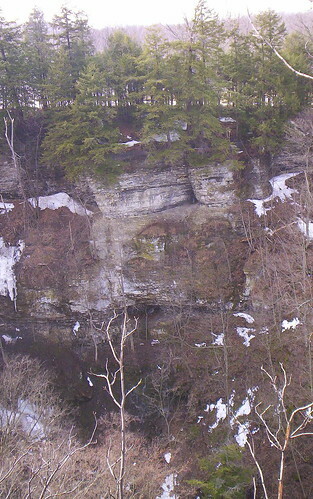 The gorge is very hard to see, as it is far, far below and the trees block the view of the stream at the bottom. If you want, click the photo to enlarge it and look for it. I parked in a small parking area off Rt. 166 perpendicular to Vanderwerker, and wandered through the small patch of woods to the gorge. If you go by only what you can see, you will easily miss the gorge as you walk toward it– it seems that the woods just continue on and on. But before you know it, the cacophony of falling water pounds your ears and the great gorge opens up before you. The wooded trail you’d followed is suddenly swallowed up by empty space 300 feet down and 400 feet across. There is a lot more water running through the area today. It is a tremendous sight. To some, it’s not as exciting as seeing Mickey Mouse at Disneyland or the Jaws shark at Universal Studios. But IMHO nobody beats God when it comes to special attractions. I took a picture of the way across the gorge. The sun was low in the sky, so the photo didn’t come out as nice as I’d hoped, but perhaps it gives an idea of how huge this gorge is. My camera was not sufficient to take the photo from the top to the bottom of the gorge. The drop is 135 feet. Great sheets of slate and limestone puncture the gorge walls. It was like someone had carefully built block upon block of different kinds of rock. We roamed the area a little, which was still snowy in patches. My sons found deer tracks and bunny dung everywhere. A large collection of muddy acorns was tucked into their pockets. And I found out that my boots are no longer waterproof. Nice. After a few minutes of quiet repose, we sloshed our way back to the van. I snapped a picture of the valley from the side of the road. Good Job! This is a pretty good article on the subject. The monument shown in the picture is located inside the cemetary. The cemetary is (appropriately) located on the former site of the fort. There is a house on the hill just outside of town, Coloniel Alden was in that house, spending the night with the daughter of some commanding officer, when the Indians and British attacked. He ran out of the house with only one boot on, and was tommahawked in the back of the head on his way towards the fort. There is a marker on the hill between the house and the cemetary where he fell (they aren’t sure this is the 100% exact location, but this is the best guess). There is also a civil war monument. That is large pointed stone in the middle of town (near the only redlight). It used to be in the center of the intersection. Route 20 at one point before the Great Depression ran through town. Back then was the heyday. Sometimes you can see ruins of bungalow motels along route 20. People used to stop and sleep at these places because traveling used to take much more time before the interstate system was built. I visited the falls yesterday – Very cool! I was looking for info on the standing stone of the Oneida’s and very happily linked to this site. I would like to add several things; As you travel along Vanderwerker road to the west side of the gorge you’ll come across a plaque(DAR?) that shows where Joseph Brant ambushed and killed a Lt. Wormuth from behind a boulder. There are several other nearby gorges of interest, one in VanHornesville and the remote gorge of the Ohisa. 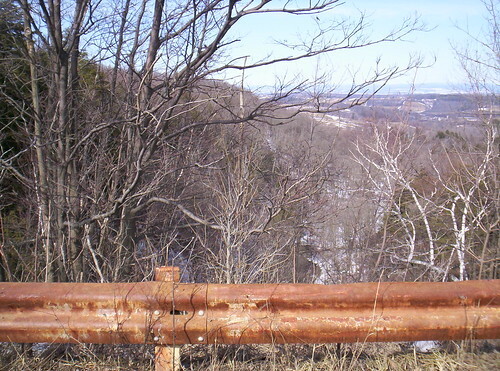 The gorge of the Otsquago in VanHornesville has a nature trail open to the public and can be accessed from a parking lot located behind the school on St.Rt.80.This is about 1[2 mile beyond the turn-off for the NYS fish hatchery. The gorge of the Ohisa may be the largest and offers no access as far as I know. All of these gorges were most likely used as routes between the Mohawk Valley and points to the south.